The community is invited to Empty Bowls from 11:30 a.m. to 1 p.m. on Tuesday, October 25, in the Whitewater Hall Lobby. This year, the Empty Bowls luncheon is being held in coordination with Indiana University East’s “One Book, Many Voices” project. Indiana University East will feature two local potters, Nate Wilson and David Nagy, in The Gallery. “David Nagy / Nate Wilson: Excellence in Clay” begins May 19 and continues through June 27. 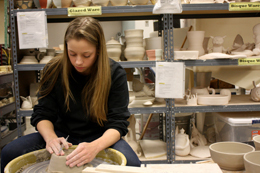 Members of the Richmond Art Club will have paintings and pottery on display in the Meijer Artway from May 26 to July 3.